When I dragged myself inside, the only thing I wanted was a salad. And this, too, is a springtime revelation. There are many of you who are more virtuous than me, but when it’s cold out, the last thing I can bring myself to eat is a green salad. Warmer days are another story entirely, though. We’re at a funny point in the year, where the farmers’ market has hoop-house spinach for me to buy, but my supermarket is still sending up Florida citrus. So: this salad. Simple. With a shallot vinaigrette, it’s a totally traditional flavor combination, but goodness—if there is something better to eat on as a very warm, mid-March day winds down, someone let me know. I had clementine oranges on hand, but let me tell you: supreming/segmenting a clementine is a fool’s errand. Be ye not so silly; use a bigger variety of orange. Make the vinaigrette: combine the shallot, vinegar, olive oil, and salt in a small bowl and whisk with a fork. Taste for salt and add more if necessary. Set aside. Supreme the orange. With a sharp knife, cut the blossom and stem ends of the orange until you can just see the fruit through the pith. Set the orange upright, and slice down the slides, all the way around, removing skin and pith. Now, insert your knife in between the membrane and each fruit segment, carefully cutting out the fruit. You might have to wiggle the segment a bit to get it to release. Discard any seeds that you encounter. Remove any tough stems from the spinach and roughly tear any larger leaves. 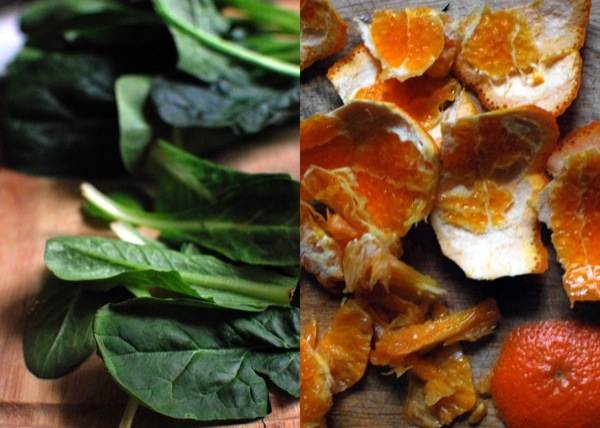 Arrange spinach and orange segments on a plate. Just before eating, drizzle with shallot vinaigrette. Serves 1 for a meal, 2 for a side salad, but this is obviously easily doubled, tripled, quadrupled, etc. What a stellar set of images. Makes me want to wander around inside this glimpsed world for a few hours. And eat a salad, of course. Thanks so much for sharing it! After such a lovely salad meal, you need a rhubarb tart for dessert. Very spring-like, I think. I won’t eat green salad when it is cold, either. We’re eating chicken pot pie, French onion soup (It’s pouring outside). I did make a version of your grapefruit cake yesterday — not sure what I think about it: sometimes olive oil cakes improve as they sit around. I’ll try some again tomorrow. I had this for lunch today! I added in avocado, a few dried cherries, and a hard boiled egg. Perfect travel meal, and plenty of room for ice cream for dessert. Beautiful photos – a couple of them made my heart hurt a little! I’m ready for Spring! Megan! I think you have before :) Thanks for the kind comment. Happy spring. Beautiful beautiful photos. Completely transporting. Love it! I feel exactly the same way. Around this time, I’ve always felt this hung in my stomach but have never been able to put my finger on what it was. Thanks for doing it for me. Beautiful photos. Happy spring! Love love love the post. Your photos are beautiful, inspiring and relax me… maybe its the lager and spring garden lounging. Great stuff. I’m going to go start planting a garden in my apartment now. What an excellent idea! I have several oranges sitting around on my counter waiting to be put to good use. Actually, I’ve really been wanting to make candied citrus peels, but I needed some inspiration for the flesh. *Enter Sarah from the Yellow House! * The weather here is such a delicious combination of cool and warm that, aligning with your theory, salad is just so perfect. Love your fine spring mood and your tiny kale plants. How I love spring! So many flowers and veggies to choose from. Looks like a perfect day! Just yesterday I noticed that it looks greener outside- spring is really here. Nothing better than a simple salad to welcome it. Katie! That’s too funny. We did have those at the house growing up :) They came back to me, as these things do…they’re cast iron and so heavy but I couldn’t get rid of them. I remember those photos; Louise has some digitals from that day. We were just talking about you. Hope you’re well! Perfect post for March. I couldn’t agree more about green salads and outdoor temps. I do have one question: Where-oh-where did you get that brown pitcher that’s in the last photo? We had one just like it growing up. Made me smile. Thanks. I’ve just discovered your blog and am really looking forward to getting better acquainted with it. Such lovely photos, and terrific writing just transports me right there. I love that about a blog, and I loved your post entitled ‘home cooks, high five!’ . It speaks right to my heart as I’ve just not been able to place my finger on why I can’t get excited over the glut of food blogs and their magazine perfect photos. It isn’t about staring at perfect food all day long. It’s about making a simple dish that soothes us, and nurtures us. Give me real, give me someone’s heart and I will never cease to read their words. I don’t want Better Homes and Gardens; I don’t want a static internet commercial every time I open a page. I want a piece of someone’s life. An insight. Thank you for providing that. LOVE the kitty looking out of the door! Happy spring! 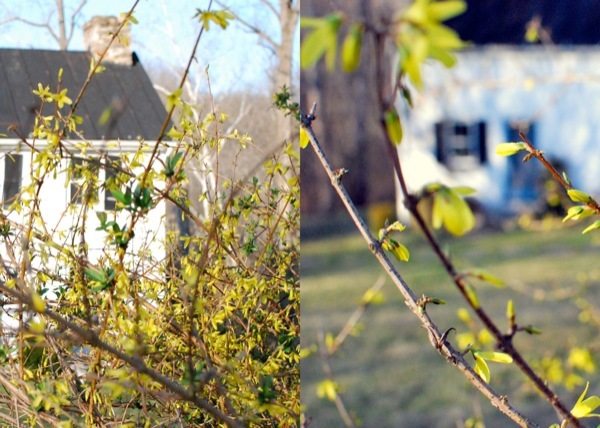 You are currently reading What to eat on an early spring evening at The Yellow House.